Want to be in total control of your payees too? 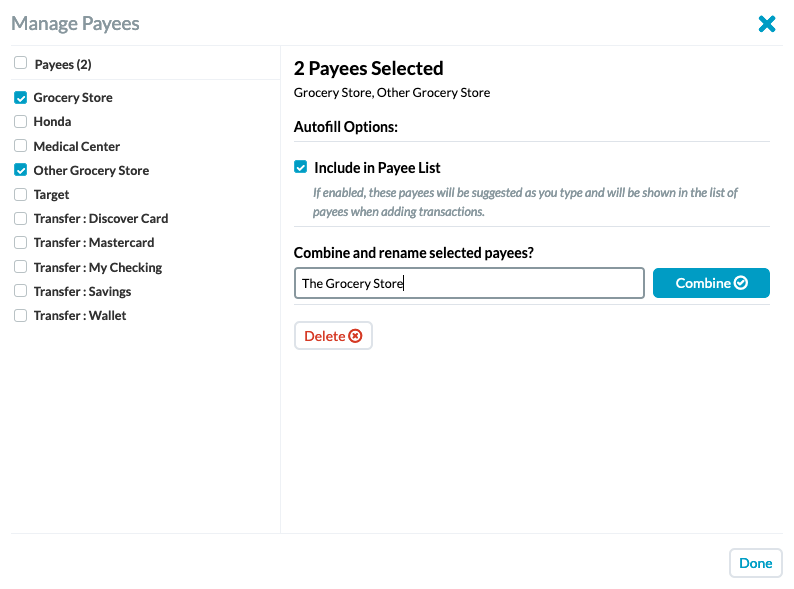 With Manage Payees, you can keep your list clean and tidy—with automatic renaming rules that work for you. Double-click the payee in the account register and choose Manage Payees. Edit the name of the payee. While you're there, you might also create a renaming rule. To edit the payees under Payments and Transfers, edit the account name instead. You can create Renaming Rules for these payees, which can be helpful for transfers—including credit card payments. You can also edit a payee without leaving the account register, and that change will only impact that specific transaction. If that transaction was originally imported, a renaming rule will automatically be created for you. 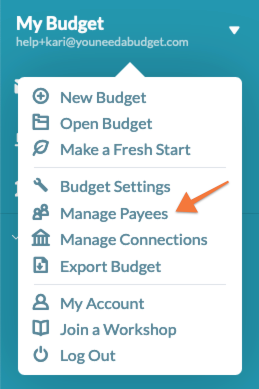 That way, if a future transaction imports with the same original payee, YNAB will rename it to save you a step. In case you're wondering—if an imported payee is edited more than once, YNAB will remember the most recent renaming rule next time. 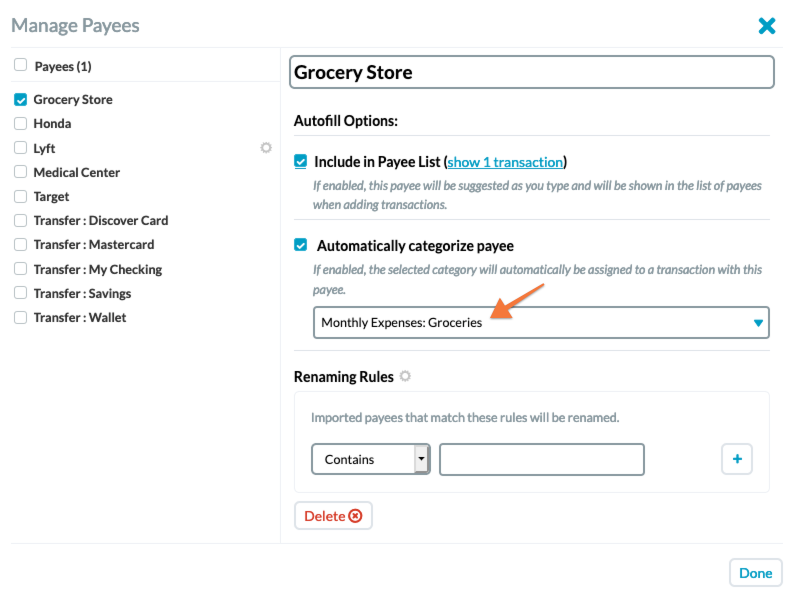 You can view, create, edit, and delete any Renaming Rules in Manage Payees. Double-click one of those payees in the account register and go to Manage Payees. From the list on the left, choose the other payees you would like to combine. Type in the new name for the combined payees. Click Combine and then Done. This is where it gets exciting! You can create rules to rename payees based on any string of letters or numbers an imported payee contains. These rules are handy for renaming imported payees where a unique date or transaction ID prevents a basic "payee is" rule from being effective. Double-click the payee in the account register and go to Manage Payees. 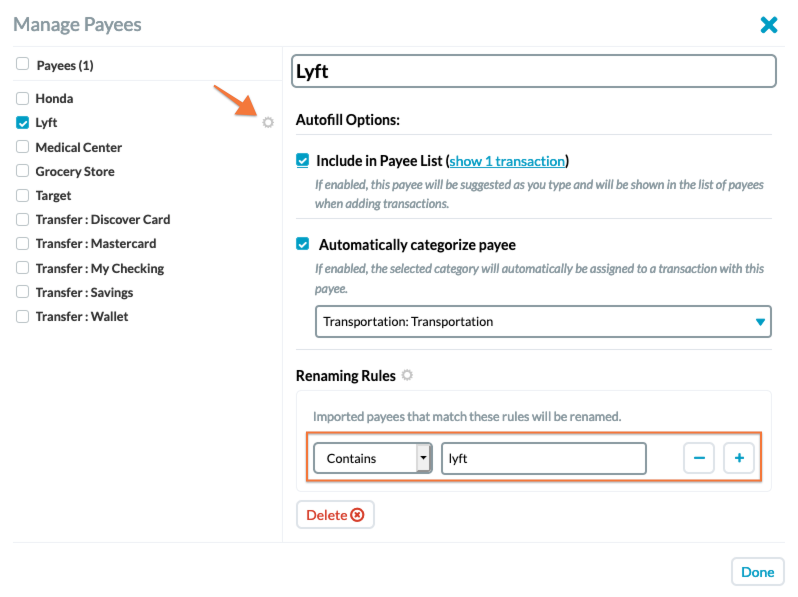 Payees with existing rules display a gear icon in the list. Create or edit the Renaming Rules. Use the plus/minus buttons to add/delete rules. This will automatically categorize all future instances of this payee, not past instances. In the list on the left, select any other payees you would like to delete. 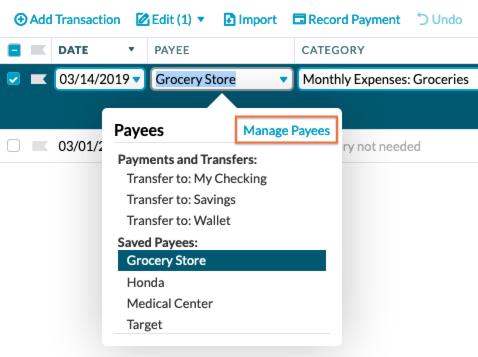 If those payees had transactions associated with them, you’ll be asked to choose a new payee (you may need to scroll down a bit) and confirm by clicking Delete again.